The day started out like any other typical work day. Little did Brandon know, the appointment he had scheduled for later that afternoon would change his life forever. That appointment was for a personalized Campus Tour of West Virginia Junior College! Brandon’s favorite class so far has been Introduction to Networking. When asked why that is his favorite he replied, “Because I learned so much in that class and I can apply it to my everyday scenarios.” He also loves having Tom Pinkerton as his teacher. Mr. Pinkerton is the Information Technology Program Coordinator at the Charleston Campus; he holds two degrees in Information Technology as well as several related certificates and licenses. 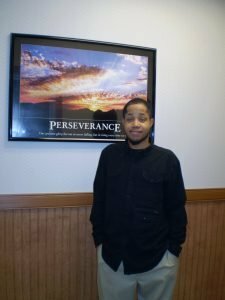 Brandon Cage is an active member of the IT Club and is quick to participate in other student activities here at West Virginia Junior College. Playing such a vital role in the student body has given him renewed self-esteem and a feeling of importance. He absolutely loves when people come to ask him for advice! If you, like Brandon, are looking for a way to better your life, please contact us at 304-345-2820. We would love to schedule you for your very own personal tour, and get you one step closer to your dream future!